Since the number one cause of fatalities in sea kayaking and kayak touring is exposure to cold water I think a review of possible immersion clothing options could be useful. This review is by no means the full anthology on the subject. I will share my current paddling ensemble with you. My hope is you will find what options work for you, your skill level and your environment. Please read USK articles, "Dressing for Immersion" and "The Dressing Game" for some additional information and considerations. Knowing the different ways we can lose body heat (conduction, convection, radiation, evaporation and respiration) is an excellent foundation for making quality decisions when it comes to dressing for immersion. The details of heat loss will be a future discussion. In the mean time check "body heat loss" on a goggle search. We also have a detailed discussion on the subject in our USK Video Volume 2 - Capsize Recoveries and Rescue Procedures. In addition, knowing that the most vital areas to protect from heat loss are the armpits, trunk and groin area will help you in your dressing choices. Here you see my paddling clothing, which can be mixed and matched for whatever conditions I choose to paddle in. The trick is picking the right combination for the very dynamic nature of the outdoor environment. Listening to your weather radio before and during your paddle is very helpful for clothing decisions aside from planning or altering your itinerary. It is an excellent idea to carry extra clothing if weather conditions are unstable. Even with the best forecast unexpected changes do occur, so extra clothing kept in a dry bag in your kayak is usually a good idea. The general rule of thumb is to dress for immersion and not for the air temperature. When I get to the put-in I open my gear bag and dress for the planned itinerary. I take into account the weather forecast and the skill level of my paddling partners. My gear bag has lots of different variations, because I like to be prepared for different conditions. For paddling in formal occasions in very warm tropical waters or those with a skin cancer death wish I recommend the bathing suit and neoprene tie and visor. Seriously, for those with fair skin (or any one who wants to keep their skin) there are a number of very light weight clothing options with excellent protection from the suns rays. I can tell that those who like to paddle while wearing a pair of cotton jeans and a cotton t-shirt or cotton sweat shirt will get the same thermal protection in the water as this bating suit. You will get more protection in the air, but once you enter the water, your thermal protection is gone with cotton fabrics, especially loose fitting ones. If you like wearing just a bathing suit, I recommend paddling in an indoor heated pool. When I paddle in Hawaii I usually wear a lightweight pair of shorts that dry quickly and are comfortable to wear while sitting all day in a kayak. I prefer a silk weight white short sleeve top. My fair skin wife Hadley uses a long sleeve top for greater sun protection. She also wears a white silk weight set of pants for sun protection. A visor, sunglasses, lots of sunscreen and footwear finish the tropical paddling set. Some even wear light paddling gloves for sun protection for the back of the hands. Since I have led numerous groups to Hawaii I can tell you the sun and the hot sand have had its toll on some of the participants who did not follow the recommended equipment guidelines. Paddling Sit-On-Top boats means your legs and feet are exposed all day. While you might feel cool as the water splashes you, the UV Rays are constant. One of the worst cases of sunburn I have seen was to the top of the feet of a participant. They couldn't walk for three days after the first day of exposure. It was a waste of precious vacation time, aside from damaging the skin. You cannot believe how hot the sand can get. Just twenty yards of hot sand can give you quite a temperature burn. We used our paddling shoes to walk to the water when we swam in the ocean. Just remember to keep the shoes above the hide tide line when you go in for a swim. 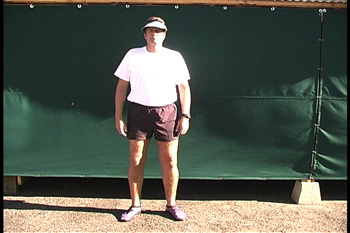 During the Summer when I paddle in the Southern California area or in the Southeast I like to wear my neoprene shorts and a short sleeve pile top. If the wind picks up, I put on my short sleeve paddle jacket. If the wind is colder, I use a long sleeve paddle jacket. The paddle jackets keep the heat in and the wind and splash out. They even work well on rainy days. If the water is on the warmer side I may choose to wear my silk weight top. If I plan to spend more time in the water in the conditions just mentioned, I would put on a neoprene top with my neoprene shorts. Having separate neoprene tops and shorts gives me different options as compared to a one piece. My neoprene top is sleeveless so I have full mobility for paddling. The two piece set is not as warm as a one piece suit, but it is easier for a quick nature call. I also wear footwear for abrasion protection inside the cockpit when I paddle, aside from the protection the footwear provides while walking to and from the launch sight. The debris on beaches these days is terrible. I have found over one dozen hypodermic needles along shorelines in the past 30 years of paddling. 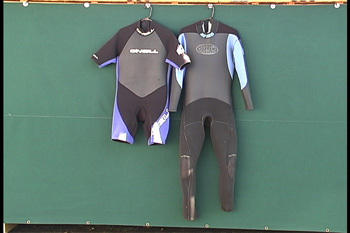 When I lived in Santa Barbara, California I used my wetsuit collection most often. I have a number to choose from. Here you see a shorty with half sleeves and half legs. Next to it is a full, one piece suit. 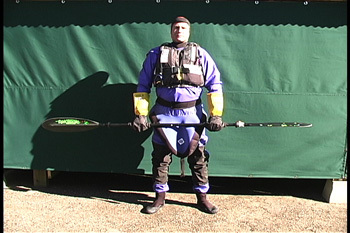 I have used this one piece (custom fit) suit often when teaching in Alaska. This was my winter garb until I could afford my dry suit. I also have a sleeveless shorty (short john) for distance paddling. A full farmer john is also good for distance paddling or standing in cold water and not getting leg cramps. Remember, wetsuits are not made to keep you warm. They are designed to keep you from getting cold too quickly when in the water. Since water gets inside, your body is losing heat when it tries to heat the water inside the suit next to your skin. The better fitting the suit the less water that flows through. The thicker the suit, the more time you have before you get cold. Since paddling involves your arms, wetsuits with arms can inhibit your paddling motion. That is why short sleeve or sleeveless wetsuits are preferred by paddlers. My shorty is great for surfing. Of course, remember to wear your helmet. My surfing suit goes from mid arm to mid thigh. Since surfing is usually a short paddle burst the restriction to my arms is not a problem. However, I would not recommend wearing this suit on a long paddle. My chaffed armpits were sore for over a week after wearing my shorty on a full day tour. A rash guard may have helped, but I cannot say for certain, because I didn't want to experiment in case it didn't work. I do know that my rash guard works great with sleeveless wetsuits. When I need to paddle in cold water and don't want to wear my dry suit, I use my short john or full length farmer john with a paddle jacket or dry top. I have my dry top hanging behind me. I always wear my dry top when it is the spring run off on the river or when I competed in the World Surf Kayaking Championships in Northern Scotland. That water was cold. This is also my So. Cal Winter paddling attire. Under the neoprene I use a variety of shirts depending on my anticipated immersion time and activity planned. I use different thickness' of polypro and/or pile. If I know the day includes a lot of immersion and wet exiting I wear my full length farmer john. In this picture I am wearing my Tillie hat. It is good on those windy rainy days. I also like wearing my Seattle Sombrero (OR product) for rainy day touring. It is a Gortex hat that keeps the head warm and the rain out. I even use it on rainy days when I work outside in the yard. If the day is going to include lots of surfing and rolling I will wear my neoprene hood and a helmet. I wear the neoprene hood and helmet during spring run off on the river. It is easy to get disoriented when cold water surrounds your head and easily gets into your ears. Just imagine an ice cream headache x 10. As a side note I had to show an example of what I call the Pacific Northwest Paddling unit. This is what I often saw in the 1990's when I would go paddle in the Seattle area and in Canada. I am not saying everyone paddles this way, but I have seen it more than I thought I would. 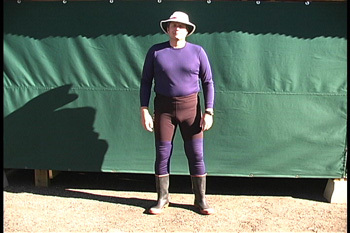 Polypro long tops and bottoms, a pair of shorts and calf high rubber boots. When I would ask about capsizing the answer I received was "I don't plan to go over." I think this ensemble would not fare well for cold water shock. I have also read enough hypothermia cases to know that paddlers in the great lakes area and the northeast would also paddle this way. This outfit does not provide any thermal protection when in the water even if you wear a paddle jacket. If you wear a paddle jacket and stay upright, this could work well. If it got colder, you would need a pile shirt to keep warm under the paddle jacket. Again, if you were to capsize and wet exit in cold water, this combination would not help you very much. I will say this paddler is ready for the Pacific Northwest with respect to their feet. The barnacle covered shores can tear up a set of wetsuit booties if they do not have thick soles. Here I am wearing calf high rubber boots for barnacle protection. I can wade into shallow water to get in and out of my kayak while protecting my boat from scratches and still keep my feet dry. In the past five years I have been using a pair of calf high neoprene boots made by Chota. They keep my feet warmer and I get great protection fro the barnacles. Their lace-up model is also good for hiking. I also wear a pair of lightweight polypro socks inside my Chota's so my feet don't feel sweaty. If you are concerned about wearing rubber boots that could fill with water if you were to wet exit, remember that wearing your PFD will still keep you above water even with rubber boots on your feet. Another reason I like the calf high neoprene boots is the extra floatation I get from the neoprene. Fortunately, the combined efforts of all of us instructors have made a difference for many of the cold water paddlers. The new Pacific Northwest standard of dress for cold water paddling is a dry suit A dry suit can actually keep you warm if you wear the proper layers underneath the suit. The latex gaskets at the neck, wrists, and ankles keeps the water out of the suit. Many dry suits now have booties attached so ankle gaskets are no longer needed. In case you are wondering, dry suits have waterproof zippers. Just wearing a dry suit over a bathing suit will not keep you warm if you went into cold water. The pile clothing under the suit is what keeps you warm. The dry suit keeps out the water so your body is only heating the air in the suit and not losing heat to heat the water as you do in a wetsuit. 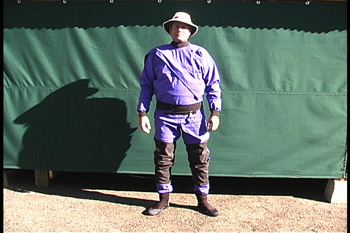 There are many features on a dry suit. I recommend you get a convenience zipper (men & woman) for #1 nature calls. Also remember to zip the convenience zipper before you go in the water to burp the extra air out of the suit. It is a mistake you will only make once. If you do it a second time, you deserve it. If you get a dry suit, get one made with Gortex. My newest dry suit has pockets and suspenders inside to keep the suit from falling around my ankles when I peel it down at lunch time on shore. For the full winter get up, let me introduce you to who my kayak buddies refer to as Buzz Lightyear. I wear this in stormy winter conditions. I have a Gortex dry suit with pile underneath, hard soled wetsuit booties, neoprene hood and a pair of Poggies. Of course, all outfits I have mentioned are completed with my PFD. Now you have it; my immersion ensemble. I have paddled in a wide range of weather conditions across North America and overseas. With the clothing you have just seen I have managed to put together outfits that have kept me warm and functional when I paddled in these different places. In order to perfect my ensemble I had to make some mistakes, which left me chilled or over heated. However, I quickly remedied the situation. There is only one way to find out if your immersion clothing will work in the conditions in which you paddle. I suggest you try swimming a fixed distance along the shore line with a friend walking along the shoreline as a helper if you get too cold. The distance you choose for your test swim should be the distance that you regularly paddle away from shore. The time in the water should be at least ten minutes if you can perform a solo recovery in less than two minutes. If your solo recovery takes three to four minutes you need to test your clothing for twenty minutes of immersion and not feel chilled. As you try your different options you will have uncomfortable days, but in the end you will find options that will work for you. Keep in mind, we all have different comfort zones, cold & heat tolerances, insulating layers (meaning body fat) and clothing availability. Therefore, use advice from others as a starting point for you to create your own immersion ensemble. Pictures seen above were taken from the USK Video "Capsize Recoveries and Rescue Procedures "